We usually remember the Romantic Movement for the exquisite art it produced, which was often full of deep emotion and great beauty. It is from the Romantic Movement that we got the great Gothic Revival, which brought church architecture towards a more Catholic feeling. 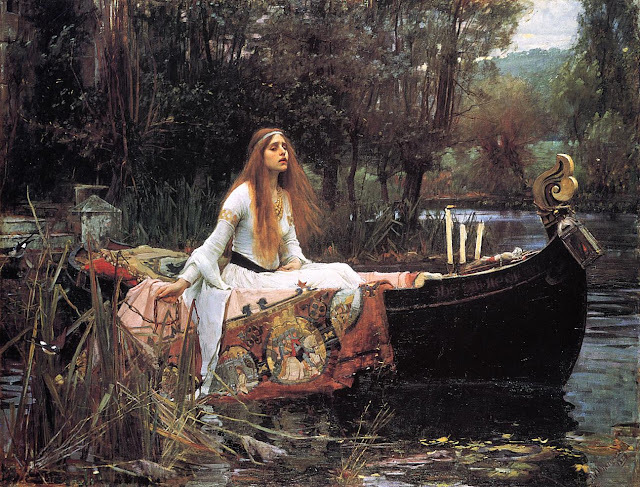 The Lady of Shalott, by John William Waterhouse, is one of my favorite Romantic paintings. But the emotions expressed in Romantic art ranged further than love and the attraction towards beauty. The Romantics also used the emotion of fear, which we find in Gothic romance. The Romantic novelists understood horror, which is the emotional shock and revulsion impressed upon us by suffering and carnage. But more effective in literature, they discovered, is the emotion of foreboding or dread, of being tortured by one’s own imagination over possible future horrors: this emotion they called terror. The Romantic movement was more than just an artistic movement, it also was political. Likewise, the Enlightenment was also political, and it lead to the absolutist state. Constitutional republicanism, in the forms cemented in the American and French Revolutions, got its start on the cusp between Enlightenment and Romanticism, a time period when older ideas had been largely digested and others were being rediscovered. The American revolution definitely was influenced by Enlightenment ideas, while the French revolution also incorporated Romantic notions. Terrorism, in its modern political sense, got its name from the French Revolution, during the “Reign of Terror” or la Terreur, when the Revolution turned inward, killing the revolutionaries themselves in great numbers. Thousands of government terroristes roamed the country, often seeking those who weren’t revolutionary enough, leading people to live in constant terror of being suspected. This forced the more moderate revolutionaries to support the violent regime at the threat of being convicted themselves. 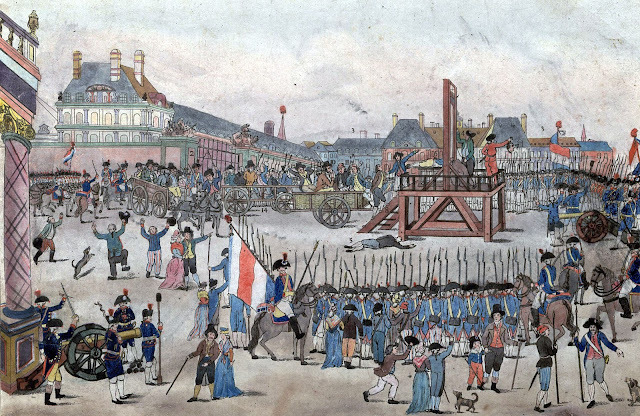 This only ended when the leader of the group, Maximilien de Robespierre, was himself guillotined. Heterodox ideas lead to heterodox means to heterodox ends. As the world fell away from orthodoxy in philosophy and religion, it fell away from orthodox morality, including in politics and war. Modern terrorism, like we recently suffered in Boston, is a result of this heterodoxy. Bad ideas can have very bad consequences. Chronicles of medieval warfare are fascinating because the Christian character often shines through. While brutality has always occurred, with the Crusades being held up as an example, we find many instances where great courtesy is extended to opponents, where fighting is limited, and where the sides put forth great effort to avoid bloodshed. We even find this in the Crusades, and on both sides. If you believe that your opponent is made in the Image and Likeness of God, that killing is a mortal sin only justifiable in self-defense and in defending the weak in times of immediate danger, that innocents have a right to life, and that no one should be dealt an unprovided death, then certainly warfare and bloodshed is minimized, despite our fallen nature due to Original Sin. This film clip would make no sense whatsoever if we did not have a remembrance of the nobility of Christendom. While this is an exaggerated piece of fiction for comic effect, it does show a Catholic understanding of courtesy and honor between the fighters. The Spaniard, as a bodyguard, has a duty to protect his employer, while the Englishman is attempting to rescue an innocent, and so they fight. They are not enemies and they have no personal reason to have a dispute, although fight they must. There is no hint of animosity between the two because of religion, nationality, social class, privilege, or ethnic origin — things which are so much a part of disputes today, and which get dissected in great detail by our contemporary media. At one time, a Christian king would have a dispute with a monarch of another land, and would take up arms in the name of justice; his followers would support him due to loyalty, but the dispute was the king’s and the king’s alone. Certainly it had little or nothing to do with the vast bulk of the king’s subjects, the peasantry, who generally had very low levels of taxation, and did not have to suffer from national conscription. Warriors of that period were sometimes greedy for the spoils of war, but often would agree not to pillage. Although they loved to fight, they were usually fighting for personal honor and loyalty and not riches: after all, honor gives greater happiness than wealth. They certainly did not fight for their country or other modern abstract concepts which arose largely during the Romantic period. The last major war which had a significant Christian moral component to it was World War I; while that war was brutal due to modern weaponry, very often the opposing sides in the trenches would refuse to fight each other. Why would they? They had no personal animosity against the other side, considering them fairly decent chaps. After all, lobbing chemical weapons over to the other side with artillery is hardly an honorable way to fight. Also, consider that civilian casualties in WWI were historically low for warfare in the 20th century. Innocents, particularly children, are not morally valid targets for warfare, and civilians, who typically provide at most remote material cooperation in their nation’s affairs, are also not valid targets. This moral principle was widely accepted by the combatants in that war. As the century progressed, the number of civilian casualties as a percentage of the total has tended to increase greatly. Were it not for the Spanish Influenza epidemic, the civilian percentage for WW I would have actually been much smaller: these statistics do take into account indirect casualties due to the hardships of wartime, such as greater incidence of disease and famine. 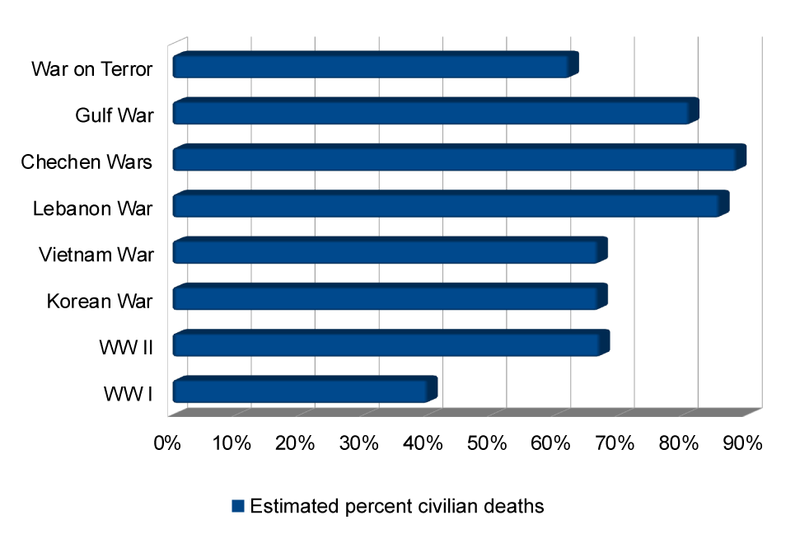 The percentage of total war deaths suffered by civilians has gotten somewhat smaller at the end of the last century and in the 21st century, believed to be due to more precise weapons and tactics. One of the side-effects of the devastation of the First World War was a loss of faith; and this loss of faith ironically led to even greater devastation during the Second World War, when civilians were directly targeted or disregarded. Moral opinions changed, repudiating the orthodox regard that is to be held towards innocents. Terrorism attempts bring the percentage to 100%, where all casualties are civilian. We saw this disregard for civilians in the Boston bombings. But why were civilians even considered a target? If the surviving, nominally Islamic and Chechen-descent suspect of the bombings had a military target in mind, would it not have been in Russia? Chechens have been in conflict with Russia since the 19th century, with several major wars being fought on that territory in recent years. Why were civilians targeted? They had nothing to do with what happened in Russia, and the typical American civilian certainly is doing nothing against Islam. They bombers didn’t even take credit for what they did. As earlier mentioned, Romanticism developed in opposition to the Enlightenment and the poisonous fruits of that ideology, focusing on feelings at the expense of impersonal rationality. Certainly the Enlightenment never completely went away, and it was revived after World War II — because it does tell some truth — and the same can be said for Romanticism, which saw a revival in the 1960s counterculture. These neo-Romantics eventually gained power and have subsequently reshaped society into our current form. Terrorism as a means of warfare developed after the French Revolution, particularly with many anarchist groups adopting the tactic. There were earlier groups who used terror tactics, such as the first-century Sicarii (literally, ‘dagger-men’) in Palestine and the twelfth-century Assassins (Ḥashshāshīn, literally, ‘marijuana smokers’) in the Middle East. They would use daylight public killings of political opponents as a psychologically effective means of instilling terror in enemies, as well as eliminating them. But modern terrorism, as developed in the nineteenth century, does not target specific powerful individuals, but rather, the general public. There are a number of reasons why this might be true. Romanticism is based on feelings, and these days we often hear someone saying “I feel that…” rather than “I think that…” What is problematic is not that feelings are considered to be a valid — feelings do have some moral validity, when judged by the intellect, but rather that feelings are promoted as being the primary means of determining moral action. Consider that the early psychiatrist, Sigmund Freud, called the intellect the ’superego’ and made it primarily an unconscious product of parents, teachers, and the culture, rather than being a consciously active part of a person. If two people feel love for each other, as goes modern thinking, then sexual activity between them is moral, no matter how unreasonable the act may be. You may not like some other people or groups: you might find their hair styles ridiculous, their food unpalatable, or whatever. Or, you might feel that your own family and neighbors are unlovable. And so, your feelings of dislike are a valid reason for attacking these others. But since we all have our own personal feelings, how can we judge someone else’s actions? From the German Romantic idea of Weltanschauung, we get the English phrase ‘world view,’ where all of reality is determined by subjective perceptions. Today, we hear people say, “Well, that is true for you, but not for me,” and so truth is considered to be relative to someone’s world view. This is contrasted with orthodox belief that there is a single objective reality for all of us, although admittedly, the truth can be difficult to find. Nationalism and moral relativism were invented by the Romantics. It was felt that the worldview of the ‘genius of a nation’ permeated its people, and so history became closely linked to distinct places and peoples, and specific ‘great men’ who shaped and dominated these. These Romantic views made history relative to specifics with no overarching themes transcending time, place and persons, and so has much in common with postmodernism. The Romantics saw themselves as being inspired by the ‘spirit of the times’ (or Zeitgeist, in the original German), which blows one direction at one time, and in another direction in another, and so they tend to reject the universal objective morality which is promoted by the Church and some other religions and philosophical systems. However, who determines which way the spirit of the age is blowing? As it turns out, young radicals will often harshly criticize the radicals of the previous generation. From the Romantics we get the notion that “the ends justify the means” — despite the fact that means are ends unto themselves — and so they ultimately repudiate morality while trying to lay claim to an objective morality. This inverts the traditional Church teaching that a good society can only be good if the people who make it up are good. Goodness permeates culture via many small, good acts, and it is absurd to imagine that many great bad acts can lead to goodness. Even the Enlightenment understood the value of the Golden Rule, but this was rejected by the Romantics. Romantic nationalism was a key idea in both racism and Fascism that became quite prominent later on. But a parallel worldview, regarding social classes instead of nations or races, led to Marxism. Instead of a genius permeating a nation, the same kind of genius instead permeates the proletariat or the avant-garde. Under these ideologies, violent conflict became easily justifiable, and they both repudiated the fact that some people are innocent. Simply belonging to the wrong group makes you a target for attack. Terror is an effective device for overcoming a person, even more so than horror. Moral obligations flow from feelings. Conflict between these groups is inevitable or even desirable. Terrorism against members of other groups is an effective or even desirable means of conflict. Terrorism works better if the perpetrator is unknown, because that will cause the enemy to tear itself apart with the fear and uncertainty of terror. Following the lead of the French Revolution, other Romantically-inspired regimes have used terror practices against their own citizens, particularly in the Soviet Union and Nazi Germany. Arrests and beatings were often done in a seemingly capricious manner, instilling fear in the populace that they may be next, while keeping them uncertain as to the cause of the arrests, leading to extreme caution. This is in contrast to operating under the rule of law, where there is a clear line of demarcation between lawful and criminal behavior, and where arrests are made according to due process. One romantic revolutionary strategy was to overburden the due process system so much that the population clamored for relaxation of the rules. A ‘strategy of tension’ was used in Greece, Turkey, and Italy in the 1960s and 70s, consisting of terror attacks orchestrated by the governments but falsely attributed to other groups, in order to make the population agree to greater government control. Due to psychological effects and the essential uncertainly of terror, it doesn’t matter who perpetrates the attacks, and since the state and its enemies all perversely stand to gain from these acts, this gives incentive to more of such attacks in the future. In the United States, there have been numerous innovations in the law since the 1960s which inject a measure of uncertainty and even fear in the population — including extraordinary damages awarded in lawsuits, relaxation of the rules of evidence, the creation of crimes based on hate, and the Patriot Act, CISPA, and related legislation — leading us to act more cautiously, misplace blame, and to support the government reflexively out of fear. During the Reformation, the doctrine of sola scriptura was developed, the idea that the faith is entirely contained within sacred scripture. This was extended to the idea that every individual reading sacred scripture would be guided by the Holy Spirit to understand the meaning of scripture. But people understand scripture differently! This destroys the unity of Christianity and the unity of creation, but it was embraced by the Romantics who interpreted the spirit as being capricious and always-changing, and has led to the conflicts that have plagued us since. The Church, and culture as a whole, does not exist here on earth in a vacuum, and intellectual trends have a great effect on religion, whether we want them to or not. We find Romantic notions of nationality and class in the church in the history of the past century or so. 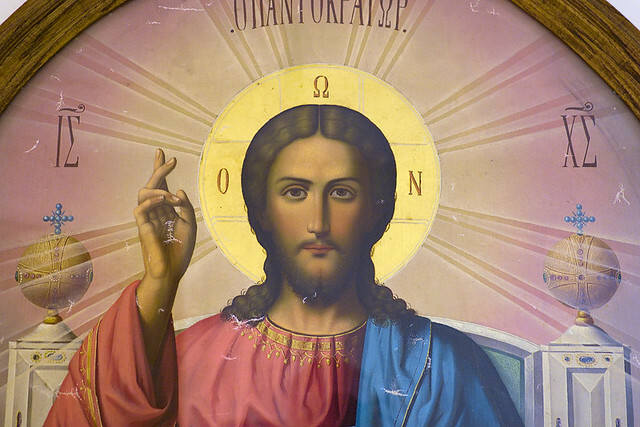 Antisemitism became quite prominent in church thinking during the first part of the twentieth century, and Liberation Theology became likewise fashionable in the second half of the same century — although both trends were censured by the magisterium. Pope John the XXIII said that it was time to open the windows of the Church to let in some fresh air, and through these open windows blew Enlightenment and Romantic notions found in the Zeitgeist of the 1960s, which we call Modernism. Perhaps it was through one of these fissures that “the smoke of Satan has entered the temple of God,” as observed by Pope Paul VI. When people refer to the “spirit of Vatican 2,” they are not referring to the actual texts of the Council, nor to the Holy Spirit, but rather the zeitgeist, or the spirit of the age, whose winds have shifted directions on many occasions since, and clearly many of the reforms of that era had a Romantic flavor to them. For example, Liberation Theology supported the use of terrorism in the struggle against social injustice, and some of the new ecclesial movements used highly suspect methods of manipulating the feelings of their adherents. Many of the facts of nature and of the human person discovered by the heretical movements of the past several centuries are true even if the ideologies behind them are not, and for this reason we cannot reject everything that comes from outside of Holy Mother Church: to do so would be acting against the virtues of science and wisdom. But they also must not be accepted uncritically, but be judged accordingly, and so this is why the hermeneutic of continuity is important. Discernment is also important: is the Barque of Peter being sped on its journey by the gentle breeze of the Holy Spirit, or by the changing tempests of the zeitgeist? (Let’s not forget that in ancient symbolism, the Ship of the Church was rowed by the laity, with the Bishops and clergy acting as the ship’s officers. In case of stormy zeitgeists, Christ is symbolized as the ship’s anchor, protecting the Church from smashing on the rocks.) Clearly, the Church must understand the zeitgeist in order to defend against it, but not to be swayed by it. We often think that Islam is a primal religion, born in the sands of Arabia, and to this day keeping true to its roots. But like Catholicism, Islam is also tossed about by the winds of change, and has also been greatly influenced by modern ideas. The fastest-growing offshoot of that religion has been greatly overwhelmed by modern ideas, and is quite unlike the richly ornamented and historically-rooted Islam found before modernity. It is from this offshoot that we find much of the terrorism of our current age. But even domestic terrorists of recent decades often have come from similar unorthodox nominally Christian sects. While these groups are often derided as being ‘fundamentalist’ we ought to consider that ideologically they have much in common with liberal religion: both kinds of sects are not historically rooted, but rather emphasize current events; they both tend to be iconoclastic, with plain white meeting-rooms, where their liturgies — if we can call them that — do not engage all of the senses. These groups encourage action which goes far beyond the boundaries of the universal moral law, including the Just War doctrine. No law enforcement or military action can stop terrorism without becoming the source of terror itself, for as we see, terrorism is a problem of bad philosophy, misguided morals, and the splintering of humanity into us versus them, and it can appear wherever anyone disregards the moral law. This is also a problem of bad leadership: as long as the ideology of modernism is accepted and promoted by the government and the culture, the problem will not go away. Sadly, terrorism might even be desired. The solution is the same as it always has been: penance, include prayer, fasting, and almsgiving; living a moral life (and I am preaching to myself here); loving your enemies even if you don’t like them; being a good example, using common courtesy in all occasions, being a good citizen, preaching the Good News, having faith, hope, and charity; seeking truth, goodness, and beauty; fearing God, not man; protecting the innocent, instructing the doubtful, and living by the Golden Rule. You don’t have to be a Catholic to do these things, but by grace it helps.